NETWORK UPDATE: CELEBRITY APPRENTICE and the rerun THE ORIGINALS each lost 0.1 in final Monday ratings, while NCIS: LA gained 0.1. 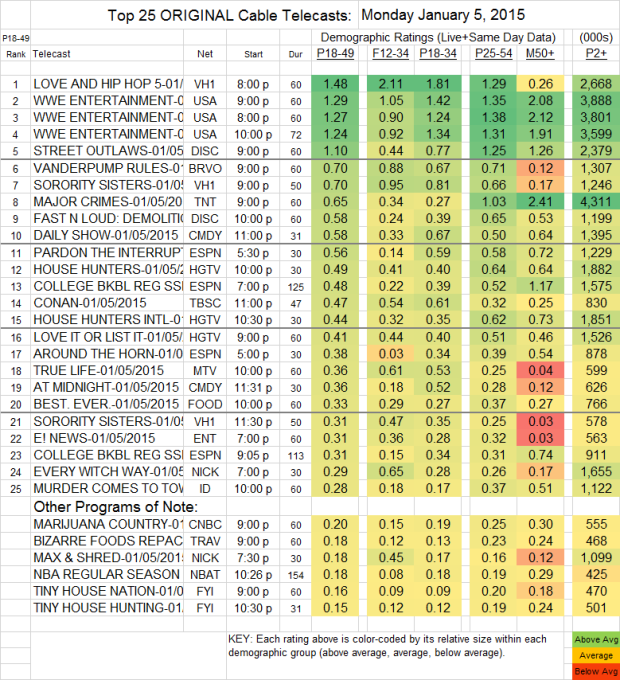 VH1 returned to the Monday schedule on top, as LOVE & HIP HOP ended its holiday hiatus at 1.48. SORORITY SISTERS was at 0.70, with another episode at 11:30PM (following a LOVE & HIP-HOP rerun) at 0.30. USA’s WWE coverage was in the 1.29-1.24 range, roughly the same peak but up almost two-tenths from last week’s low hour. On Discovery, STREET OUTLAWS was up 0.05 to 1.10, but FAST N LOUD: DEMOLITION was down 0.07 to 0.58. TNT’s MAJOR CRIMES lost 0.08 to 0.65. On Bravo, VANDERPUMP RULES gained 0.12 to 0.70. MTV’s TRUE LIFE was at 0.36. It’s not on the chart, but BRANSON FAMOUS (Tru) was at 0.05 with 113K total viewers.